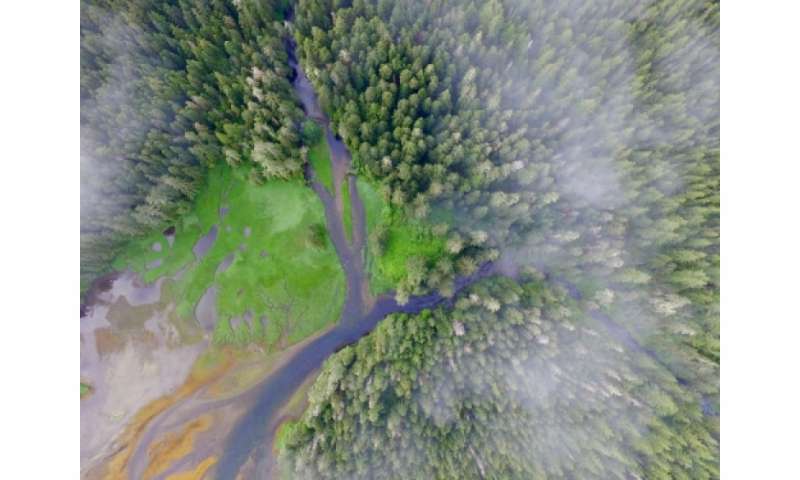 Human occupation is usually associated with deteriorated landscapes, but new research shows that 13,000 years of repeated occupation by British Columbia's coastal First Nations has had the opposite effect, enhancing temperate rainforest productivity. Andrew Trant, a professor in the Faculty of Environment at the University of Waterloo, led the study in partnership with the University of Victoria and the Hakai Institute. The research combined remote-sensed, ecological and archaeological data from coastal sites where First Nations' have lived for millennia. It shows trees growing at former habitation sites are taller, wider and healthier than those in the surrounding forest. This finding is, in large part, due to shell middens and fire. "It's incredible that in a time when so much research is showing us the negative legacies people leave behind, here is the opposite story," said Trant, a professor in Waterloo's School of Environment, Resources and Sustainability. "These forests are thriving from the relationship with coastal First Nations. For more than 13,000 years —500 generations—people have been transforming this landscape. So this area that at first glance seems pristine and wild is actually highly modified and enhanced as a result of human behaviour." Fishing of intertidal shellfish intensified in the area over the past 6,000 years, resulting in the accumulation of deep shell middens, in some cases more than five metres deep and covering thousands of square metres of forest area. The long-term practice of harvesting shellfish and depositing remnants inland has contributed significant marine-derived nutrients to the soil as shells break down slowly, releasing calcium over time. 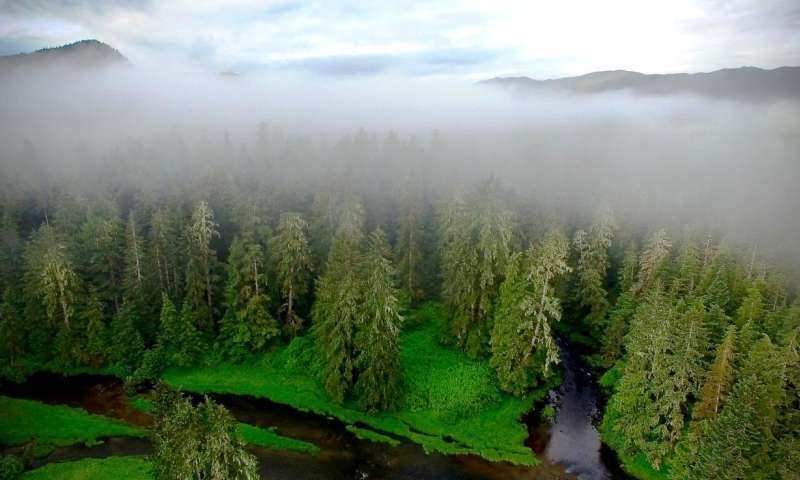 The study examined 15 former habitation sites in the Hakai Lúxvbálís Conservancy on Calvert and Hecate Islands using remote-sensed, ecological and archaeological methods to compare forest productivity with a focus on western red cedar. The work found that this disposal and stockpiling of shells, as well as the people's use of fire, altered the forest through increased soil pH and important nutrients, and also improved soil drainage. This research is the first to find long-term use of intertidal resources enhancing forest productivity. Trant says it is likely similar findings will occur at archaeological sites along many global coastlines. "These results alter the way we think about time and environmental impact," he said. "Future research will involve studying more of these human-modified landscapes to understand the extent of these unexpected changes." The study appears today in Nature Communications. Whether it is better or worse depends upon the definition of better or worse. In other words, this is a value judgement. Having trees grow nice and healthy is "good" to the extent that trees grow. But other things thrive on dead trees too. Are they "bad?" This happened before we learned to dig toxins out of the ground and use mechanical equipment to tear down mountains. Now, corporations live on destruction for profit. George kamburoff posts for self-gratification. Picture a mirror and some mood music. I can't believe you would publish this without a little more specificity that it only applied to this one area. Climate change deniers will use it to say scientists are denying it. Basically this article shows that Pre-Industrial Revolution peoples, ones who are dependent on the land for their survival, tend to take much better care of it in the long term. That the First Nations Peoples lived in close contact with Nature and understood that they were a PART of Nature, not separate from it, and so they worked to make it better for future generations by not destroying what they already had. Compared to our city people today that would be absolutely horrified if they actually had to watch their food being produced, the First Nations Peoples were very much in touch with it all, they knew Exactly where their food came from, and so were careful to make sure those areas thrived. Very Different than "Western" Man who does not even bother learning the land, just what he can steal from it, leaving the destruction for other generations to deal with, which has gotten us to this point where the impact of mankind on this planet is no longer even a question. First Nations Peoples lived in close contact with Nature and understood that they were a PART of Nature, not separate from it, and so they worked to make it better for future generations by not destroying what they already had. You mean the guys that hunted horses and camels to extinction in their homeland, which means they were left without any potential for good domesticated pack animals? Whoever improves the soil, cultivates land lying waste and drains swamps, is making conquests from barbarism. It's very unlikely they knew what they were doing or had any intention behind their actions. These people weren't sedentary farmers who knew or cared to improve the soil on purpose, but roaming hunter-gatherers who came in and stopped to eat on the way to somewhere else. They simply had a waste management problem of what to do with the shells, and they solved it in the simplest possible way that comes to man: drop it on the ground. The reason why the shells are so concentrated is that shellfish go bad really quickly once out of the water and become hazardous to eat, so all the shellfish they caught could not be transported many miles inland and so they piled up where the people took camp in the woods. First off they were farmers. "A team of researchers at Simon Fraser University has revealed that First Nations from Alaska to Washington state were marine farmers using sophisticated cultivation techniques to intensify clam production. "Researchers have concluded the clam gardens dated back more than 1,000 years, and Lepofsky said she strongly believes some were more than 3,000 years old. "She said First Nations applied sophisticated management techniques to mimic ideal clam-growing conditions, including using stone terraces and sediments at appropriate elevations in the tidal column. "Sustainable practices, such as periodically turning over the soils and harvesting selectively, would have emerged to sustain the enormous populations of First Nations believed to have inhabited the coast, Lepofsky said. "She estimated that number to be in the hundreds of thousands." Second, there is a great deal of evidence that precolumbian native americans had many ways of limiting population growth, which is indeed the effort to live in harmony with their environment and plan for the long term health and survival of their tribe. -And we can also assume without looking that their reproduction either culturally or biologically had begun to align itself with the seasons, as babies born in early spring had a much greater chance of surviving the following winter. Only western cultures with their virulent religions seek to outgrow and overrun their enemies by any and all means, which is why the native americans were no match for them. Perhaps... this was the behavior of the first pioneers who came from the tropics and bred tropically; that is, all year around. The farther north a species resides, the more its reproduction is in sync with the seasons. Bearing children out of season wastes resources. There is also less attrition from predation and disease compared to the tropics. So as people become adapted to the climate and resources of temperate and subtropical regions their birthrate declines. Initially however there would be a surge of growth in the absence of intertribal competition leading to a corresponding scramble for food and fuel. Large herds would be driven by fire into traps and over cliffs. Forests would disappear. I think that if we were to really examine the cause of western "fat seeking," as the Sioux call the white western peoples, we would find the basis of hoarding everything for one's self in monarchical governance. Many native cultures realized long ago that humanity is related to all things and as such, all things need to be treated with respect. It is easy to say such things, but much harder to prove. At least one South American culture figured out that recycling human feces into the ground made things grow better. This is far in advance, IMO, of the Roman version of flushing it into your neighbor's back yard. If you look, my bet is you will find native cultures are much more intelligent than you think. Climate change deniers will read what ever they want - into everything. I think this is really interesting to think about. Puts a lot of perspective on things. Chicken Little went on a 2 day 1200 miles jaunt, spewing over half a ton of CO2, which is over 10% the annual average. Read whatever you want into that, but it's interesting to think how the Chicken Little has so much disregard for its own shortcomings. Imagine if the Chicken Little didn't pretend to care so much for the environment how much more gasoline it would have burnt. Puts a lot of perspective on things. Unless you benefited from the products of mining, which is EVERYBODY. Luddite. But I think people are starting to get it. We can get by with what we are doing, but the real problem is Overpopulation. Even if we were as harmonious as Native Americans or other tribal peoples, a large enough population would inevitably destroy the environment in some way. We have to get control of population growth, or dont, and hope that we can keep coming up with technology to sustain us without destroying the planet. And by the way, Animals such as humans are supposed to enhance the environment, by spreading our excrement on the ground and fertilizing the soil. Spreading natural things, such as shells or wood, is generally good. It is our tendency to create Unnatural Things and spread those around that really damages an environment. Native tropical cultures 'realized' the same thing. But their birthrate in conjunction with their technology caused chronic overpopulation which is why they were forced to move north in the first place. Unadapted interlopers quickly stripped the landscape but gradually adapted to temperate environments. An early wave had time to become neanderthal. But each was overwhelmed by successive waves of tropical interlopers. Eventually, religions were conceived which exploited the tropical reproductive potential in temperate tribes. They negated the adaption process and maximized growth in order to resist incursion, and to outgrow and overrun their local enemies. And they would not stop outgrowing and overrunning until they had filled up the earth as their god had ordered. This was the enemy the amerinds faced. Nurture had finally trumped nature. Human husbandry had prevailed. God was finally domesticated. That is the biggest lies I have ever read. We need to teach our children the truth, or this world will continue to be blinded with false statements. The British actually destroyed everything in their path. And the Rothschild's who came out of Britain are the biggest proof. I remember Bill Gates calling on all the wealthy to donate all their money when they die. That was the biggest joke one of the elite has done thus far. They have the money and capability to out live all of us. By the time anyone of them die. The world will be to much far behind to actually save it. Over 40 animals are now extinct because of us. every part of nature is dying at a fastest rate. World pollution has tripled. Education has become for profit, not for the children. Bill Gates you are a joke. What you should have said, lets not be greedy and do what we can now, as far as investing in cleaner energy. Lobbying for our children regarding education instead of lobbying ways to increase your wealth. Jongdan! quote You mean the guys that hunted horses and camels to extinction in their homeland, which means they were left without any potential for good domesticated pack animals? Where do you get your research. The natives only hunted what they were to eat, not for pleasure like the western world that made over 40 animals in our life time extinct. You have never heard of any animal that became extinct when the natives cared for this land. You have never heard of any native destroying nature. Littering, polluting, and creating unclean waters. It was the western culture that introduced them to their first disease and sickness. Western culture has destroyed everything that was apart of nature thru greed, ignorance, and power hungry. Ancient humans aren't alone in changing their environment to their benefit. Well then there are beavers too, you didnt forget about beavers did you dusty? Gkam - you have to admit that Thorium has a point here. I can't see us ever 'not mining' - it would mean returning to the stone age. Perhaps we are in the process of becoming more selective. Coal is on the way out - and oil and gas behind them. Recycling will go a long way too. 'Cradle to Cradle' is a neat book - about designing everything to be 100% recycled. A little at a time. Use of empirical data to draw subjective conclusion. It seems as though these guys missed it. When I saw the title of this piece, I just knew prolific entertainment would follow.........I just had to let ya'll know, and thanks for the entertainment thus far, keep it coming. Science believes that local environmental degradation was the cause of the collapse of some civilizations. Rulers certainly had the eyes to see such degradation and analyze its causes to determine what to do about it. However, they were either unable to determine the causes, unable to determine what to do about it, or simply chose to do nothing believing that some higher power would swoop from the skies and save them much as some believe about modern society's environmental abuses. Monarchy again prevailed. Some, though, learned the scientific method and improved their environment as science is now beginning to understand. I see lots of fat in some places in the world, and little in others. I think the argument of overpopulation could easily be seen as waste of resources. I think you should be embarrassed to display how little you know. "computer modeling laying the blame squarely on humans and only very slightly on climate. "The study found a total of 177 large mammal species (weighing at least 10 kilograms, or 22 pounds) died off between 132,000 and 1,000 years ago, the period before human-caused extinctions became a tad more obvious. These included mammoths like that skeleton above, giant sloths, giant armadillos, giant kangaroos and wombats—put "giant" in front of a lot of mammals and you'll find one that doesn't exist anymore." "In general, at least 30 percent of the large species of animals disappeared from all such areas." -Hunting involved driving whole whole herds off cliffs using fire. The scientific method? Rulers examined the evidence and concluded that every tech advance was met with an even greater rate of growth. 'Science believes' ??? Do you have the phone number for this 'science'? Does he have an office somewhere perhaps? Environmental degradation is a symptom of overpopulation. You 'see'. Are you this 'science' person? I think the ONE BILLION ABORTIONS which have taken place in the last century, and their descendants to the 3rd and 4th gen who were never born as a result, is a much better argument. The title "People enhanced the environment, not degraded it, over past 13,000 years" was quite misleading. Someone skimming would think this applied globally and to the modern day as well. Poor guy, those research grants are going to be a lot harder to get now. I guess he didn't get the memo that humanity is scum and a blight on Gia. Do you include yourself in that assessment?